"It is a truth universally acknowledged that Lady Catherine will never find a husband for Anne…"
"When a fortuitous accident draws Anne away from Rosings and her overbearing mother’s direct influence, she is able to think and act for herself for the first time ever. In the society of her cousins Darcy and Georgiana, and, of course, the lively Mrs. Darcy, Anne reveals a talent for writing and a zest for life. Anne de Bourgh is a sympathetic character whose obedience and meekness were expected of women in her day. As she frees herself from these expectations, Anne discovers strength, independence, and even true love in a wonderfully satisfying coming-of-age story." I read Pride and Prejudice by Jane Austen immediately before this read, and I was glad to have the delightful story continue for me. Judith Brocklehurst picks up the story a few years later, after the Darcy's have settled into their new life. This is not focused on Darcy and Lizzy, though, and is actually about the domineering Lady Catherine's daughter, Anne. We were introduced to Anne in P&P, but we only got to know her as the sickly frail one who was destined to marry Mr. Darcy. Of course, Darcy defied Lady Catherine's plans and now Anne needs to get herself a husband. Since it is Darcy and Lizzy's fault that Anne has no one to marry, Lady Catherine sends Anne to Pemberley and tells the Darcys it is their responsibility to find her a husband now. Preferably someone who Lady Catherine can enjoy pushing around conversing with. Of course this embarrassing situation is a blessing in disguise for Anne, as she is finally free from the confines of her mother and her 'vinegar-faced' servants after 25 years of her subtle prison at Rosings. She meets new people and has a chance to think for herself and finally begins to feel comfortable in her own skin, and shockingly, healthy! She gets to explore her feelings and her talents and discover things she had never known before. A whimsical moment that must be shared with Pride and Prejudice fans is the simple fact that Mr Bennet, Lizzy's father, actually goes to an Assembly at the behest of Lady Catherine, when for some twenty years he has refused to do so for his wife. And Georgiana Darcy, the sister to Mr Darcy whom we met briefly in P. & P., is featured in the novel as a companion for Anne as she is also looking for a husband. Lady Catherine's true colors shine through and is the epitome of the character you would love to hate. Seemingly obligatory for the romance novels that have daughters bickering with their mother, Anne of course falls in love with someone unsuitable for her rank and drama ensues. "Does he love her? He is going to move to Barbados!" And of course Anne fell in love with the first gentleman that crossed her path. It is a wonder if that is truly how it worked in Regency England; there does not seem to be much actual dating, but rather if one got along all right with the other while dancing then the next step most logically was marriage. What happened to you have to kiss a lot of frogs to get your prince? But such was the way it seems in the olden days. How odd that the divorce rate increased after we became pickier. The storyline may be a bit predictable as a coming-of-age story, although Anne was a bit old to be doing so at age 25, yet the characters involved are still so endearing that it makes the read a worthwhile one. There is some of the Austenian dialogue, though not quite as in-depth as Jane Austen was, but still some conversations were had that certainly had the nuance of the Jane Austen wit and charm. Although the events did not move very fast for the first half of the book, the writing itself is so simple that it makes it an easy read. The story greatly picked up its pace throughout the last half with an ending that tied everything into a neat bow. Brocklehurst's easy style is not nearly the quality of prose of a deeper Austen read, it is actually a bit short at around 200 pages. Yet, Darcy and Anne is still a fun continuation of favorite characters with an outcome that can't be beat. 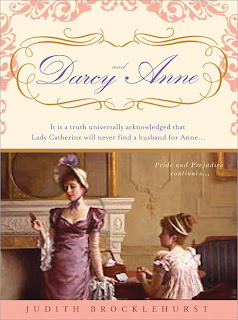 The author Judith Brocklehurst passed on October 2008, but was delighted when she learned that Sourcebooks was going to reissue her self-published title "A Letter from Lady Catherine" as "Darcy and Anne". Rumor is that her sequel to Mansfield Park is also possible.